The long-running British industrial dance trio returns with box set via Pylon Records and tour dates. Industrial dance progenitors and electronic body music purveyors Nitzer Ebb get their due with a comprehensive box set of their music. The long-running British trio started in 1982 and made waves in the U.S. with their “Godhead” video, which aired on MTV’s revered alternative music show 120 Minutes. Nitzer Ebb 1982-2010: The Box Set features 10 vinyl LPs comprised of newly remastered versions of all five of their Geffen and Mute-released albums, plus 5 albums of bonus tracks and rarities. The box set will arrive on October 5th via Pylon Records. The limited edition color vinyl box set will also include their self-released debut album, Basic Pain Procedure, available exclusively through Pylon Records’ website store. The box set features expanded double black vinyl of each album, with several bonus tracks and hard to find 12” mixes - all carefully curated and remastered by Pylon Records. The original artwork has also been expanded into gatefold sleeves, with embossing and spot UV finish. It also contains a large size booklet with liner notes by the band's co-founders Douglas McCarthy and Bon Harris, along with unseen photos, flyers, and artwork, detailing their entire career in chronological order from Essex to Los Angeles. These albums have been out-of-print since the early '90s and have never been reissued prior to this. 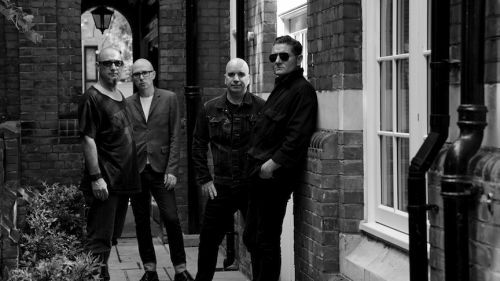 Nitzer Ebb has been on hiatus since 2010, but band founders Douglas McCarthy and Bon Harris have returned and confirmed several European tour dates, and they will be announcing more shows in the near future. McCarthy and Harris will be joined onstage by co-founder David Gooday and go-to graphic designer Simon Granger who is behind Nitzer Ebb’s provocative album graphics and other artwork.